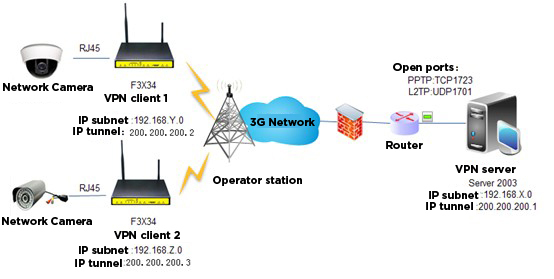 By VPN to achieve both ends of the subnet data communications, F3X34 connect the VPN server via internet, the two ends with static routing allows the server and client of subnets can ping through each other in the DOS, the effect is equivalent to on both sides of the computers in a local area network. So camera video signal can be transmitted over the network to the server and can be viewed, video storage and other applications in real time. To establish VPN, routers and VPN server segment must be in different network segment. If there are multiple routers to be connected to the same VPN server, each router must occupy a unique network segment and can not be repeated . The network camera or video server, its IP address and the wireless router addresses on the same network segment, the gateway to a wireless router address, other functional configuration, please refer to the video server user manual. 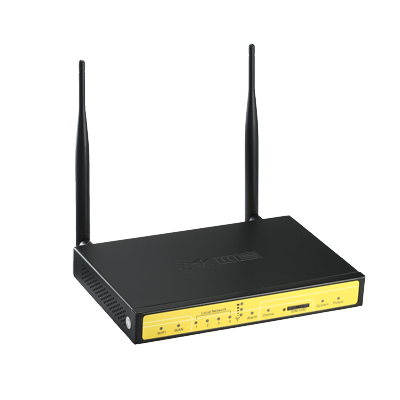 F3X34 series Industrial ROUTER is a networking router for wireless communications, to provide users with wireless long-distance data transmission capabilities. It takes high performance industrial grade 32 communications processors and industrial grade wireless modules, embedded real-time operating system software support platform, while providing an RS232 ( or RS485 / RS422), 4 Ethernet LAN, 1 as well as a WIFI Ethernet WAN interface , which can connect serial devices, Ethernet devices and WIFI equipment to achieve transparent data transmission and routing functions. In practical application VPN networking, F3X34 router should be open 3G services in SIM / UIM card to provide network then to configure VPN (PPTP or L2TP), and other necessity functions. Establish a VPN server on a PC (Server 2003) as a monitoring center, for remote management and real-time video management, it need a fixed IP or domain name, and the VPN server do port mapping services.